Today I spent the day at Sloatsburg Elementary School where Eleni Pallogudis and her third grade class is working on growing plants with her students. She asked me how she can use the Chromebook to take pictures of the plants. We started by discussing what goal she was looking for with her students and we worked with a few different tools. Finally, we determined that the best tools for creating a Plant Journal with pictures would be either Google Docs or Google Presentation. Eleni chose to use Google Presentation. The students opened Google Presentation on their Chromebooks, chose their own themes, then named and titled their presentations. 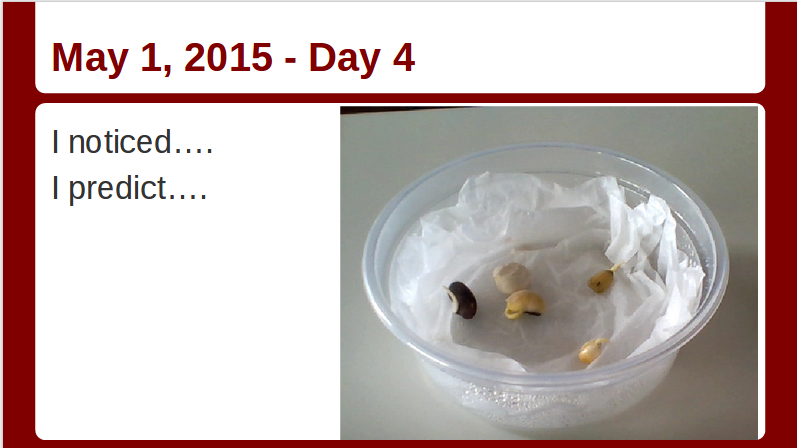 Next the students did some observations on their beans and wrote about what they noticed and predicted. They wrote their notes on their second slide. They clicked "Take a snapshot"
Finally, they choose their photo (if they had taken more than one) and selected the one they wanted to use.